There are many factors which are responsible for skin pigmentation also our skin tone can change as we grow older. Here are some tips for skin whitening that you can use whether you are suffering from skin damage or premature aging or if you want to get a fair complexion. (1). The first step of skin whitening process is “ avoid direct sun exposure” In order to save your skin from sun, try to use a good quality sun block on a regular/daily basis. Buy a moisturizer with an SPF of 15 or higher and use it every morning after washing your face. Sun block is very essential because it helps prevent dark skin, U.V rays and premature aging. (2). The second step is skin exfoliation and which is very essential for removing dead skin cells in order to whiten and brighten your skin. If you want you can use this simple home exfoliation remedy. Make a mixture by mixing 2 tablespoons oatmeal + two tablespoons brown sugar + ¼ cup of milk. 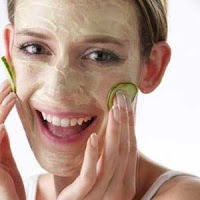 Use this mixture and gently scrub your face, and rinse with water, and after this, apply a good quality moisturizer. Use this remedy for at least 1 week. Make a paste by mixing 1 tablespoon each of sandalwood powder + lemon juice + tomato juice + cucumber juice. Apply this paste on your skin on your face, wait until it dries. Rinse and moisturize. which is a type of natural skin whitener. In order to use it - Apply a thin layer of the extract 2 times i.e. in the morning and at evening, after you wash your face and before you moisturize. Note: First use it on a small area of your arm to ensure that you do not have an allergic reaction.